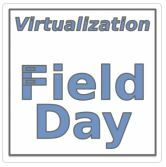 In a first of series of blog posts covering some of the vendors that caught my eye at VFD4, I’d like to introduce you all to Simplivity. Hyperconvergence, Convergence, Modular, Traditional – Lots of buzz words used in I.T. covering a multitude of offerings but for the purpose of this post I’d like to define hyperconvergence. Simply put, this involves collapsing several I.T. building blocks such as Compute, Storage, Networking & Apps into a single building block that can be deployed to a datacenter with minimal fuss. Simplivity have taken this a step further by intelligently adding capabilities such as Backup with Dedupe, D.R., WAN acceleration and Cloud Gateway. The diagram below (taken from Simplivity) highlights the journey from the traditional stack to a Hyperconveged stack. This truly simplifies the method of deploying virtualisation stacks to a datacenter and encompasses several technologies aiming to make this a lean and cost effective approach to companies wanting to go down the road of virtualisation. Simplivity uses its patented Omnistack technology on commodity x86 hardware to give you its building block known as the Omnicube. All views expressed in this post are mine and do not represent the company I work for. This event was fully paid for by Gestalt IT and I received no compensation in benefits or money to attend this event. I’ve been back in the UK for a few days and before I offer my thoughts on some of the vendors that caught my eye, I would like to offer some words of wisdom on the interesting people I met. The key to any event is PLANNING, PLANNING and more PLANNING. Gestalt IT has run several events over the last few years so I’m sure this is becoming second nature but you can never be sure when there are so many cogs spinning in an intricate timepiece. Think of Steve Foskett as the master conductor. He directs the orchestra comprised of Tom Hollingsworth and Claire Chaplais to create the most stunning music piece that you could ever imagine. This combined with the percussionists (the vendors) resulted in a display that ensured all the components of the band came together well to hypnotise the audience (the delegates). Organising logistics of the day, the evening activities and ensuring the media crew are on point was fascinating to watch as I am also a planner at heart and enjoy managing several elements in I.T. so it was refreshing to see this from another perspective. Credit to the Gestalt IT team in putting these wonderful events together as they really bring together a great bunch of delegates from around the world to converse and interact with senior representatives from the companies that were represented. Larry Smith Jr was a very quiet guy in front of the camera but clearly liked a varying amount of technology both in the networking, virtualisation and the DevOps side. A well liked individual who contributed well. Amy Manley was the only lady on the delegate panel and she has both the brains and the beauty of a true virtualisation chick lady. Well thought out questions were posed from her and she had a broad range of experience also. It was also refreshing to hear someone else that had used the Dell Foglight product before as well as her political challenges at work similar to some of mine. Christopher Kusek (make sure you do not call him Chris) was brilliant in his questions and I particularly liked his questioning process. He had the most diverse set of skills and this has been built up with years of experience both working for vendors and for other companies. I was glad to learn from him also. James Green, the tallest youngest member of the delegates (made me feel like a dwarf), had attended a previous TFD event and is also very good in the virtualisation (VMware) space and also the blog post master delivering live blog posts after each day. What a machine !! Emad Younis was a quiet succinct delegate who really thought about the vendors that were presenting before presenting killer questions. A great fellow and very admired amongst the group. Mike Preston was the only Canadian in the group and got a lot of stick for it. He co runs the Toronto VMUG and has been in virtualisation for a loooong time. A great chap to have in the team and was happy to enjoy the better weather in Austin compared to Ontario. Julian Wood was my fellow UK blogger (a South African at heart) who was methodical and precise with his questioning of the vendors. It was his first VFD like mine and clearly enjoyed every minute. I’m sure our paths will be crossing again soon. Matt Simmons was another quiet member of the team who had some great Linux and Virtualisation skills enabling him to dig deep with the presenters where he saw weak areas. A great all rounder. Jeff Wilson was the only Microsoft centric guy but this was good as its always nice to see how Hyper V is represented amongst the vendors. It was good to talk to Jeff about Systems Center and know how he has used Azure and this spearheaded some of the conversations with the vendors. Marco Broeken came in from the Netherlands and is someone I have followed for quite some time due to the VMworld events he has attended and the after hours events he has organised. Another previous TFD delegate that has a wide scope of knowledge and very amenable with the crowd. Lastly, Justin Warren, who has his own company and is a passionate journalist from Melbourne, was one of the guys who I learned a lot from. His calm demeanour and outward appearance may lure you in but you never know what he is going to ask next. His inquisitive mind was what I liked the most and I’m sure I’ll be using some of his tips and tricks in my own posts and future direction. So that’s a long list of delegates and organisers and I can say the experience is something I will never forget and would relish an opportunity like this in the future. As I cover some of the vendors in my next post I’ll be sure to include the names of the individuals that caught my eye as well as the technology that underpinned much of the vendors core go to market strategies. Stay tuned folks….